Let these reels take you on a journey through the picturesque Chinese landscape. Click here to play! There’s plenty to see and plenty to win in this online slot adventure. The symbol of the dragon is one of great importance in Chinese culture. Thought to possess great powers, this mystical creature will be the bringer of good luck and fortune in this online slot game. It’s a wild, which means it will replace all others to help you create more winning combinations. It will also expand across an entire reel in the MegaWild feature if it appears on reel 3. There are plenty of other symbols to help you in your journey through this foreign land, including the Chinese girl. She is a multiplier and will double any payout if she appears in a winning combination. 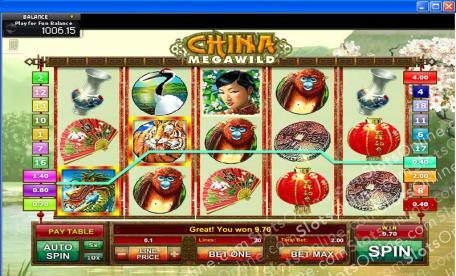 Other symbols include tigers, pandas, monkeys, cranes, lanterns, fans, yen, and the lotus flower all of which will payout anywhere from 20 to 500 times your line bet if you can spin two or more across an active payline. Take a trip to the East in this amazing online slot, and you may just return from your journey with plenty of green lining your pockets. The Chinese girl is a multiplier symbol. If she appears right after the winning combination along the active payline, the payout is doubled. The mythical dragon symbol is a wild. It will replace all others (except the multiplier) to help create more winning combinations. If it appears on reel 3, it will expand to cover the entire reel.